New audio CD series brings self improvement and live mastery tools to families. Success in school, as measured by grades, will be more likely to occur because of the motivational effects of success on self esteem. Crime will more likely be diminished or eliminated from the lives of children who listen to the program and develop these key values, attitudes, and beliefs. Life Mastery Unlimited, LLC, a new start-up providing life mastery resources for parents and families in audio format, today announced "The Unlimited Child," an audio CD program designed to facilitate development of a positive internal belief system in all children. The Unlimited Child pairs well-researched techniques like unconditional affirmations and positive reinforcement with sixty-beat-per-minute music to create a complete and enjoyable listening and learning experience for kids. "This CD program leverages the latest research on childhood development and employs tried-and-true techniques to enrich and empower children," said Tina Janke, company spokesperson. 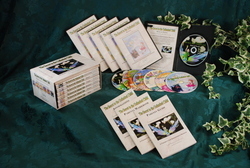 "This program will help children in school as it promotes the development of values, attitudes, beliefs, and other cognitive goals and objectives, giving them a head start in the world of intellectual ability and information," according to Dr. Jim Moore, a school psychologist for over 40 years who is associated with the company. "Success in school, as measured by grades, will be more likely to occur because of the motivational effects of success on self esteem. Crime will more likely be diminished or eliminated from the lives of children who listen to the program and develop these key values, attitudes, and beliefs." The Unlimited Child program contains nearly 400 powerful affirmations, a parent's guide, a parent's workbook and an affirmations guide. The CD program currently available on the company's website, priced at: $189.00. Available in standard and Christian versions, the company plans to distribute the CD program through traditional retail channels, including bookstores, once final agreements are in place. According to Janke, the program was developed to provide parents and grandparents with the tools necessary to counteract the negative messages and influences that characterize our culture. "Because top psychologists agree that we become a product of our environment, The Unlimited Child promotes a nurturing and affirming environment with exceptionally positive key elements that become a natural part of the inner belief system," she said. "It is these Attitudes and Values that become the foundations for living a successful, happy and truly extraordinary quality of life." Life Mastery Unlimited, LLC, is headquartered in Grants Pass, Oregon. For more information, please visit: Unlimited Child.